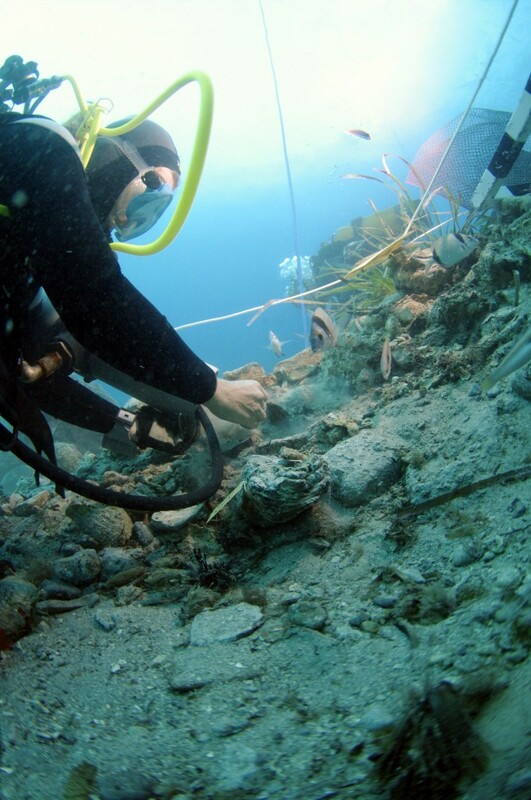 WHAT: IRON AGE SHIPWRECK | WHERE: CARTAGENA, SPAIN | EXCAVATION: 2007-2011 | DATE OF WRECK: 7th C. B.C. 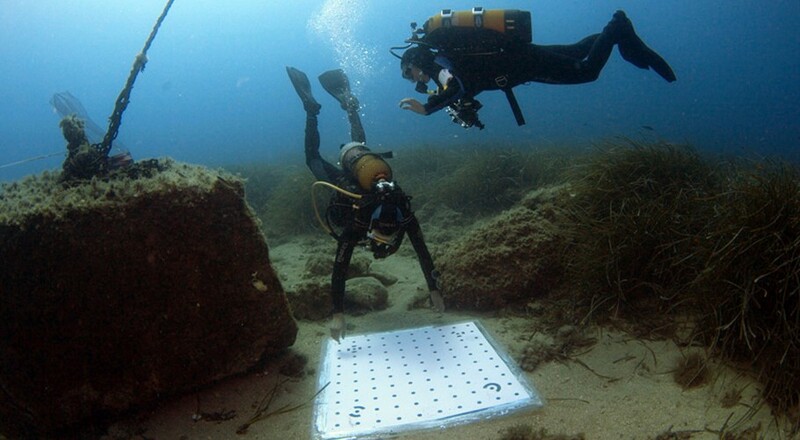 Although there were three wrecks at Bajo de la Campana (Phoenician 7th century B.C., Punic 2nd century B.C., and Roman 1st century A.D.), a submerged rock reef off the coast of Spain near Cartagena, the focus of this INA project was the 7th-century B.C. 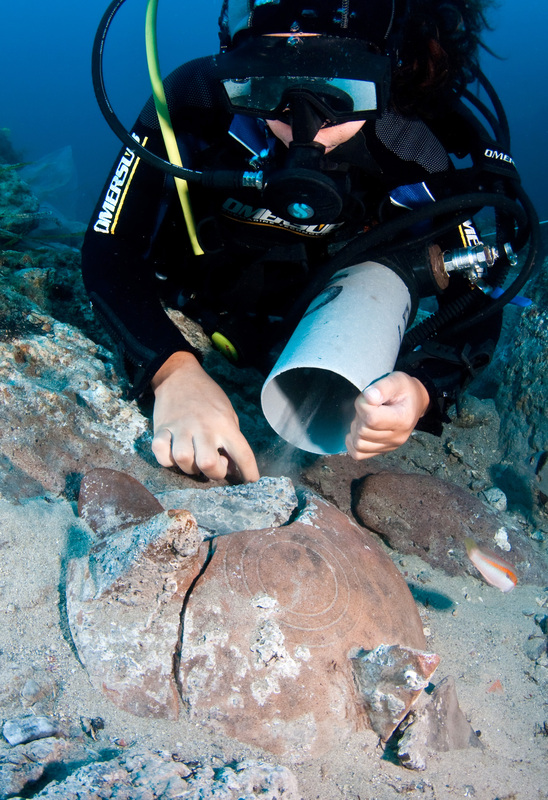 wreck, which was the first Phoenician wreck to be excavated by archaeologists. The project logged almost 4000 dives equaling over 300 hours on the shipwreck. The vessel itself had run aground in antiquity, and its cargo ended up clustered in a sea cave, which was excavated and documented over four field seasons. Under the direction of INA research associates, archaeologists recovered fragments of the hull along with broken pieces of amphoras, bowls, plates, and other ceramic vessels, 10 elephant tusks, 28 small tin ingots and two more of copper, hundreds of galena (lead ore) nuggets, pine cones, nodules of amber from the Baltic region of northern Europe, and numerous large, round ballast stones. Of the ships themselves the team found over 100 metal fastenings, fragments of lead hull sheathing, and several small wooden structural elements believed to have been used in stowing the cargo. Recovered personal items belonging to the crew include a tiny stone cube that may be a gaming piece, and a stone rod that appears to be a whetstone. The latter bears what looks like Phoenician graffiti scratched onto its surface—quite possibly the owner’s name. The team also found several double-sided wooden combs; these however seem to be part of the cargo rather than grooming items used by the crew. In addition, several nuts and seeds, including an acorn, a hazelnut, and an olive pit, give some idea of the provisions carried on board for the crew’s sustenance. The Bajo de la Campana ship was likely a trader from the Eastern Mediterranean that journeyed to the Western Mediterranean, bringing luxury goods that were traded or gifted to elite members of the indigenous societies, by Phoenician merchants and colonists, in exchange for commercial privileges and access to the abundant natural resources of the Iberian Peninsula. These objects, combined with the impressive array of raw materials that we recovered from the ship’s cargo—elephant ivory, tin, copper, lead, timber, amber and resin—provide exciting new insights into the Phoenician presence in Spain and the western Mediterranean. Polzer, M. and J. Reyes. 2007. “Phoenicians in the West” The INA Annual 1:57-61. Polzer, M. and J. Reyes. 2008. “Phoenician Rising: Excavation of the Bajo de la Campana Site Begins.” The INA Annual 2:5-10. Polzer, M. and J. Reyes. 2009. 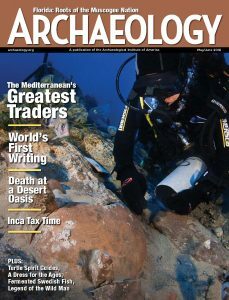 “Bajo de la Campana 2009 Phoenician Shipwreck Excavation.” The INA Annual 3:3-13. Polzer, M. and J. Reyes. 2011. “The Final Season of the Claude and Barbara Duthuit Expedition to the Bajo de la Campana, Spain Excavation of a Late Seventh–Century B.C.E. Phoenician Shipwreck.” The INA Annual 4:6-17. Polzer, M. 2012. “Iron Age Phoenician Shipwreck Excavation at Bajo de la Campana, Spain: Preliminary Report from the Field.” In In Between Continents: Proceedings of the Twelfth International Syposium on Boat and Ship Archaeology edited by N. Günsenin, in press. Oxford: Oxford Books. Urbanus, J. 2016. “Masters of the Ancient Mediterranean.” Archaeology May/June 2016: 39-43. ABOVE: An archaeologist uses hand-fanning to uncover artifacts (Left Photo: INA). Arianna Villani airlifts sediment surrounding the tripod bowl in C7 (Right Photo: INA).